Usually I make the paddles with a center shaft and laminated blade and grip pieces, but I have one order for a single piece "solid" paddle. 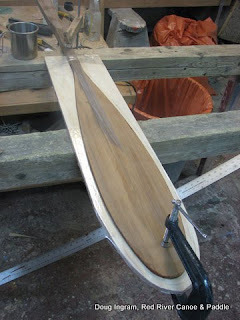 When making a paddle like this it is important to cut the paddle over large, then let the wood "settle" prior to cutting it to final dimension. Most of the paddle tips are routed for the epoxy tip. One, however, is a cedar blade which requires a more durable edge treatment. Lately, I have taken to laminating thin hardwood strips around the perimeter. However, this one is having a black epoxy border. Later I will be applying 2 oz. fiberglass. 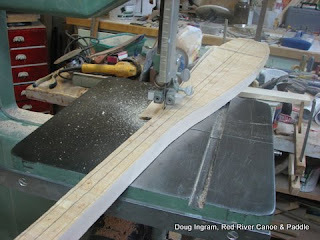 I prepare a plywood backer which has a cutout in the center to allow it to come in full contact with the shaped paddle edge. 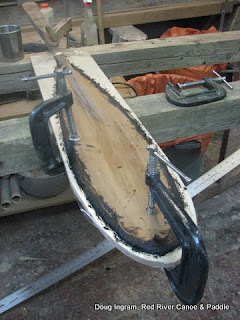 The plywood is covered with packing tape as a mold release so that the epoxy does not stick to it. Thickened epoxy is applied around the edge. 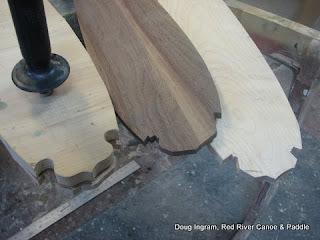 When it is cured it will be shaped as the the paddle blade edge. Posted by Doug Ingram at 8:10 p.m.